Protect your valuable property, fish population and boat docks from costly ice damage during the winter. 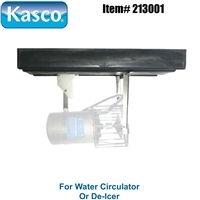 Kasco De-Icers can help you prevent ice damage and save you time, money, and headaches with winterization methods of the past. 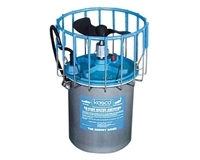 Fully salt water compatible and Arctic proven, Kasco De-Icing products are the cost effective, energy efficient solution to your ice damage problems. Maintaining surface water will allow light penetration and maintain oxygen levels, preventing a winter kill situation and keeping your fish safe all winter. Unless, you are fortunate enough to live in a climate that never get below freezing, you're going to need some type of device that keeps a hole open in the pond during the winter months. A pond deicer is one of the best ways to use melt a small hole allowing toxic gases to escape your pond.